The old village, as described here. These wash-houses survive beside Addiewell Farm. 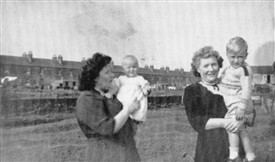 They were the wash-houses for some of the houses in Livingstone Street. Some were running north and south and comprised four streets together with a row of foremen’s houses, and two smaller rows running east and west formed what was known as the Wee Rows of the village. Three of these were of the single-end type of house [one-room], the others “but-and bens” [two rooms]. The foremen’s houses were of a more substantial nature. Each house was named after a famous or noted person: Campbell, Simpson, Baker, Graham, Cross, Banks, and Faraday. 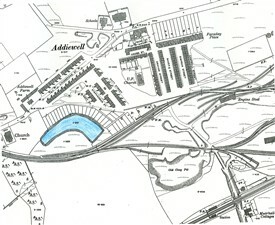 A “square” divided this half of the village from the other half to the west, comprising Watt Street, Stephenson Street, Davy Street, and the double-sided Livingstone Street of one hundred houses. These streets were two-storey buildings, with semi-circular outside stairs to the stair-head which gave access to two houses, each with but a single room and kitchen. Water was supplied by stand pipes or “wells” in each street, and had to be carried and stored in buckets or tubs within the house. In winter great inconvenience was caused when the wells froze and had to be thawed – there was a trek of half-a-mile to nearby Scolley-burn to replenish stocks if the supply was cut off. Waste water was disposed of in shallow brick lined ditches (schouchs) which ran the length of the streets, and emptied into the drains below. Behind these mothers and children can be seen the rear of Livingstone Street. John Kelly. All Rights Reserved. S1. 251. No communal wash houses were provided, each householder provided his own, usually a lean-to at the back with a barrel to collect rain water from the rhones. For those with no lean-to, it was common practice to the do the washing outside with a brick-built open fire to heat the large pots of water. Sanitation by present standards was almost non-existent, and the outstanding in primitive amenities was the privy midden (shunkies). These abominable structures were sited at some distance – but not too great a distance – from the houses. Open on one side where ashes and all other household refuse was thrown in, and closed (not very adequately) on the side which served as a latrine. 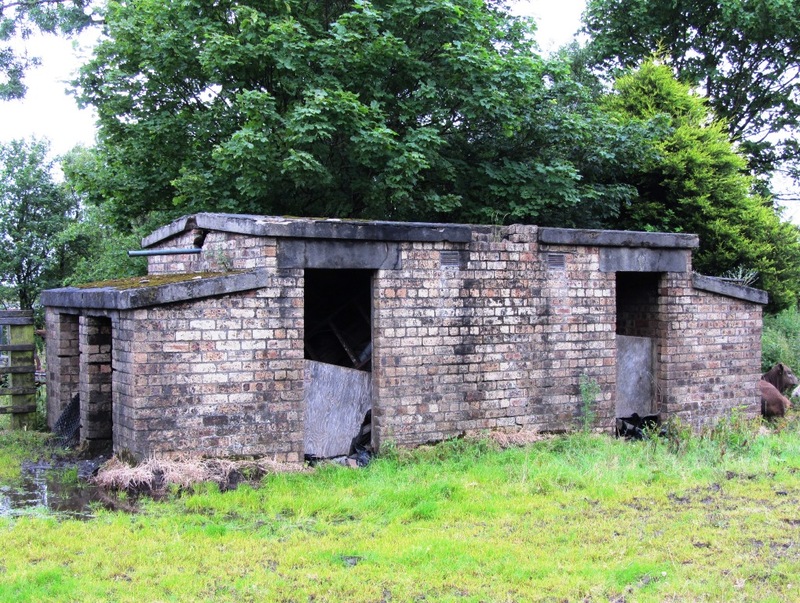 Such was the make up of Addiewell around that time, and despite such unclean conditions, the standard of cleanliness, neatness and good breeding was a matter of genuine surprise and admiration. People continually strove and even competed to further their comfort at their own expense. Midlothian Advertiser, 3 March 1947. ‘The End of an era at Addiewell’, part one. Wash-houses - or are they shunkies? - behind Livingstone Street, 1930s. John B. Murray. All rights reserved. S1. 629. Some of these are very pleasant recollections but a subject ignored and almost considered unmentionable is that of the appalling sanitary conditions that prevailed even up to as late as 1924. Until that year, except for the houses of both policemen and the Co-operative, there were no water closets [toilets] in the village, although Faraday Place houses, the foremens’ row, each had an individual dry closet and a tap with running water of their own. There was no provision of lavatories of any kind whatever for women or girls, either individual or communal, up to the year 1924. There were communal buildings for men here and there in the village of the most primitive type, with no privacy whatever. They were cleaned once a week. They were the breeding grounds of all kinds of flies. There was no running water in the houses, which had to be carried from wells positioned at intervals in the streets along the “gutters”. The full article can be opened as a PDF attachment on the Addiewell Histories page. Article on old Addiewell in the Midlothian Advertiser, 3 March 1967.